I am in a similar situation as we are moving and I need to have better storage for my fabric, etc. I will have a large room just for my sewing and have decided on Ikea cabinets with glass doors to keep out the dust and some light. I have had my fabric in bins and find them way too heavy and cumbersome to move around so I loose track of what I have. Now it will be sorted by color and size, all readily accessible. Yea!! 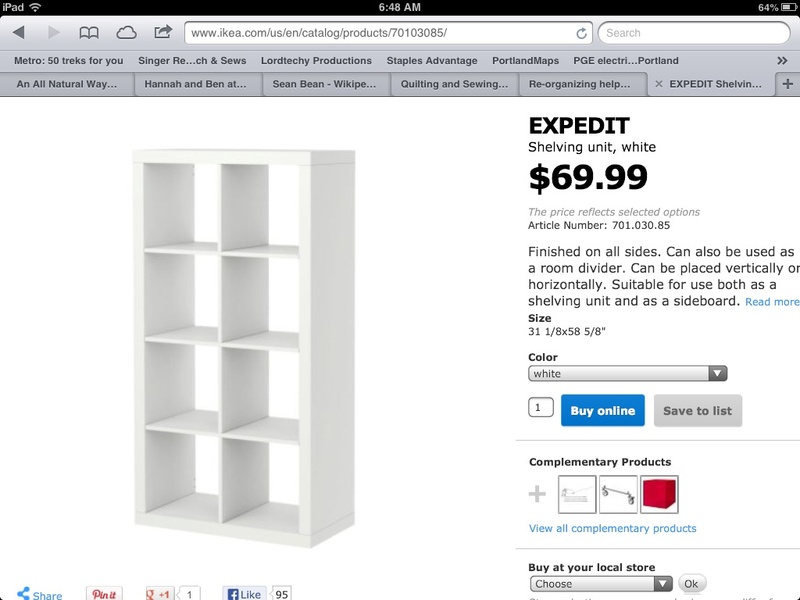 Ikea has several options on size and style- check out their online catalogue. I believe I have seen storage units made of open weave wire covered in plastic. They would allow you to stack fabric etc. inside the units without it falling through unless it is very small and allow air to circulate also. The fabric would also still be visible which would save a lot of digging. You may have inspired me to try reorganizing my stash using such shelving. If actual shelving is not available perhaps you could just purchase a lot of the plastic milk carton like bins and stack them on their sides to create your own shelving unit. If you or someone in your life is good with cabinetry, I would build or have built a floor to ceiling, closed cabinet, as wide as you can, but no deeper than 24". The disappearing act happens even with a back on a cabinet. My husband is building me one with four sheets of furniture grade plywood. 8' tall, by 4' wide, 18" deep. I will post a picture when it is done. I do have some storage boxes though that I got fairly recently at Home Depot, made by Rubbermaid and called All Access. They close fairly tightly, but in addition to the lids they have a clear door on the front that not only allows access, but allows you to see what is inside. I am using them for cameras storage, because we have five different cameras and accessories. Just some thoughts. Have fun! If you can I would place shelves on the wall. Worried about light a curtain or a number of curtains to draw back, with the shelves looking like a quilt shop walls and clear plastic boxes with other notions etc, to open when you sew.love the idea. I'm not sure what art bins are, but I too use labeled bins and baskets for different colored scraps and supplies, and stack my folded yardage on a couple of 8' bookshelves. There is also room to store seldom used boxes or packaged batting on top as well. I had my fabric in bins and it was too heavy to move comfortably. I put all my fabric on boards and into a cupboard and find it much handier. My miscellaneous bulky junk I put into bins and put them in the wire stacking units from Walmart. I have *always* stored my fabric folded on shelves inside an armoire with the doors closed. Each shelf holds one or more stacks of fabric by color (depends on the size of the shelves) and I just lift out the whole stack of 60-90 fabrics (about 12-16" high) when I need to audition a color. They are protected from light, fading, dust, dirt, mold, and 'loss' (really misplacement!) by this method. My collection probably has over 800-900 different prints/designs of fabrics even though some are less than 1/3 yard. As fabrics cost so much and I have an extensive and even older collection, I look at them as the largest investment that I have made in my art. Therefore it is worth the cost of proper storage to me. Check out second hand stores for good armoires. Thanks for the suggestions, I am sure I will be using an assortment of options!! My DM and I invested in Sauder storage cabinets many, many years ago and never regretted our choice. They are about 70"X 18" and have adjustable shelves and latched double doors. (Forgot...I think they are 30" wide) I have four of them, side by side and wish I had room for the other two that are stored(full of fabric) at DM's house. Don't know if they are still available. Have to assemble is only "Yuk", but not too bad. What has worked well for me is the metal channels you attach to the wall, then insert shelf supports and add 12" wide shelves. I have them across the back wall of my sewing room. Then I have regular shelf units at right angles to them on the side walls. I much prefer the 12" shelves. Although the wider shelves of one of the storage shelf units is great for UFOs. My DH made my fabric storage cabinets, 8 foot tall, 14 inches deep, 36 inches wide, shelves are 13 inches apart. I store my fabric on Minnie bolts made of foam board or folded using my 6X24 ruler. The top half of these cabinets are made of peg board great for hanging all kinds of goodies on. My finished tops, waiting to be quilted, are stored with there backing in an old china hutch, UFO's are stored in project boxes with all fabric, instruction's, pattern, and anything else needed to finish the project. I use the wire cube you put together and hang a quilt you made infront of it. this way the fabrics and UFO will have airflow and not get musky. stacking bin tends to make me forget what I have in them. I have two cabinets that I purchased at Target like this one but mine are about 60 inches tall--I can't find it on line but the store had mine in stock and I paid about $39 for them. I bought comic book backing boards on Amazon and file folder rubber bands at Walmart. I fold my fabric and wrap it around the boards like the fabric stores do and then put a large rubber around the fabric to hold it in place. I would send a picture but we are in the process of moving so everything is in storage. I have stacking bins that look like drawers. You can get them at Wmart, Dollar stores. I have some on casters that fit under my sewing table. I only put large pieces such as upholstery in the larger bins. I keep the UFO close for when I get bored and want to work on something for just a short time. I have a UFO for embroidery and one for quilting. Sometimes you can get some decent priced bins at the office depots when they're on sale. I always only by the clear that I can see through. You can also ask for the material boards and bolt boards if they are in the waste basket or near the cutting table. No matter where I find them, I still ask if I can have them. You can use them as is or cut them easily with a box cutter down to the size you want. Those are free. They would just recycle them anyway and the stores are more than happy not to have to pay to recycle them. I have stock kitchen cabinets from a big box store. The wall has upper cabinets, lower cabinets, a counter top, just like a kitchen. I have my Big Board and a cutting mat on the counter. Be sure to put electrical outlets on the wall for an iron and lighting. Here's a storage solution from Ikea. I know you said you don't want open bookshelf a but these are small compartments that make it easy for organizing. You could buy two and stack them. My husband installed wire bins in my sewing room closet. I love these bins. They slide out with ease when looking for fabric. They are airy and allow for circulation. With my fabric in the closet I don't have to worry about fading. The bins do come out if you want to take them completely out, I've never had the need to remove them. Having my fabric in the closet leaves more space in my small sewing room. These bins were purchased from Lowes, reasonably priced. Last edited by Pieces2; 06-24-2013 at 08:14 AM. Both of these are considered wardrobes so they are deeper than book shelves. However, they are not the same depth. The first cabinet was for children's wardrobe. So it is only about 18 inches deep (interior). The the one is about 23 inches deep (interior). I got the 2 different ones because of the size of the space I was trying to fill. Originally my fabric was wrapped on comic book boards and stored in bins. I thought about bookshelves with doors. Then I realized that I had a lot of other quilting related stuff that would not fit on standard bookshelves. So I bought these cabinets and refolded all my fabrics for the depth of one of the cabinets. This is working better for me. The 'clutter' is behind doors - which pleases my husband. And the fabric is stored by color. With these cabinets I still have room for some 'bins' which contained everything for some UFO's. homedeopt now has bins that have a clear plastic "door" on the side so that you can see in and open them up when they are all stacked up. I have a couple but use them for books in my basement storage room. they are great. maybe think about those for a bit and you can also get those metal shelves and stack them on there. you can make the metal shelves just about any height that you need. if you can get an armoire that would be best or cabinetry or something with doors and shelves in it that is best I find for anything really. post a pic of the area with an idea of what you are thinking of doing and maybe you will get better ideas. I built my storage from these bins (5 high by 7 wide) and gave up after the whole thing collapsed twice, nearly killing my cat. The problem is separation, especially at the bottom; then, if you try to adjust a single unit, the whole thing collapses. I now use prefab cubes and comic boards to store my fabric. No glass or cover in front. Hi, DianneK, A cheap way to use open back shelves and not lose fabric would be to buy nylon screening and tack it to the back of your bookcase. It would allow air to circulate and nothing would slip down from the back if you tack it well along each shelf. Nylon screening is easy to handle, and is inexpensive.